I am super proud to announce that I have been awarded a grant from Arts Council England for the development of my one woman show ‘The Secret’. The Royal Exchange Theatre in Manchester is providing rehearsal space and hosting an industry showing, and I am delighted and honored to have Sue Roberts (Editor at BBC Radio Drama) directing, Louise Wallwein (poet and playwrite) as a mentor and my dear and talented friend Jude Jagger (the best in Manchester) as production manager. The Secret is a 60-minute auto-biographical one woman play I wrote and performed for Manchester Fringe in July 2017. 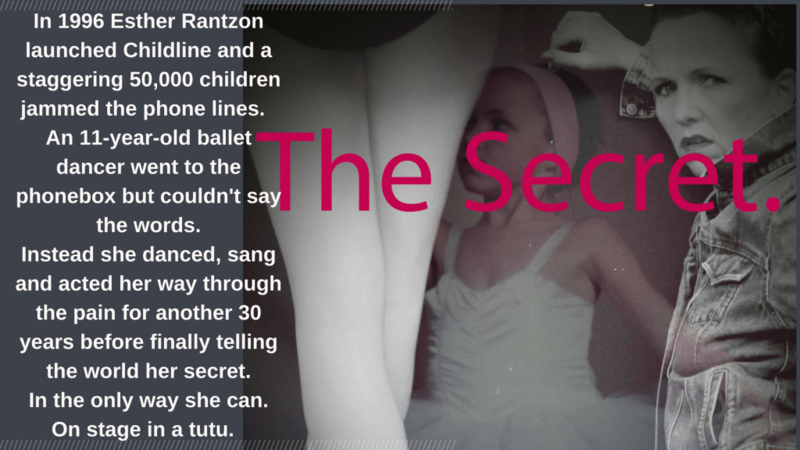 The Secret uses dramatic monologues, spoken word, poetry, song, dance, standup comedy, physical theatre, verbatim and multimedia to tell my story and subsequent recovery from Childhood Sexual Abuse. It uses footage from my TV career and real ‘legal’ documents and interviews from the trial. The show sold out immediately with incredible feedback and major interest from the press. I also won the ‘Ground Breaking Theatre’ award from Greater Manchester Fringe. So what’s the Secret? What’s the big deal and why am I posting about it? Part of my Arts Council Funding requirement is that I raise £500 myself. Now I HATE asking for money, anyone that knows me – will know that I don’t ask for help and would rather crack on myself, and if I don’t raise the required amount I will self fund it. But I would prefer to ask you for help. 1 in 20 children in the UK have been sexually abused. Over 2,900 children were identified as needing protection from sexual abuse in 2015/16. 1 in 3 children sexually abused by an adult did not tell anyone. For some reason I was that 1 in 20 and that 1 in 3. But I was lucky I had a talent and passsion for performing and that always pulled me through. I have enjoyed over 20 years as a professional in this crazy industry and my theater school is also entering it’s 14th year. My biggest achievement (aside from my son) is that I found the strength to go to the police. Consequently the man that sexually abused me will never be allowed any contact with children. So I have already done more than I ever expected. But I have so much more to do, and I need my friends, colleagues, students families, ex students and anyone that knows me to be a small part of the journey that will ensure we don’t have a generation of adults that need fixing, and instead we all raise happy, healthy children that aren’t sexually abused. You see, it’s not just about The Secret. In conjunction with the show our CIC company will launch a series of workshops, events and activities that will empower and educate single mothers, carers and their children about and against the perpetrators of Child Sexual Abuse and Exploitation. Using evidence based practice these creative and drama based events and activities will reduce the risk of children being sexually abused and furthermore the long term benefits will reduce the effects of CSE/CSA in society (addiction, self-harm, PTSD, domestic violence). Look, I did ok – considering. Life is peaceful, happy and calm. I don’t wake having nightmares anymore, I don’t suffer, I don’t feel any guilt or shame. Instead (and with help) I have learnt to live in acceptance and I truly appreciate every day – all I have and all I don’t have. So yea, I don’t like asking for help but I am not the little ballet dancer anymore. I am a mother, a teacher, an auntie and a protector – and I also put on a bloody good show- so please consider giving a couple of quid?